December 2016 marked the end of a three year project to catalog Columbia’s rare Hebraica and Judaica collections. 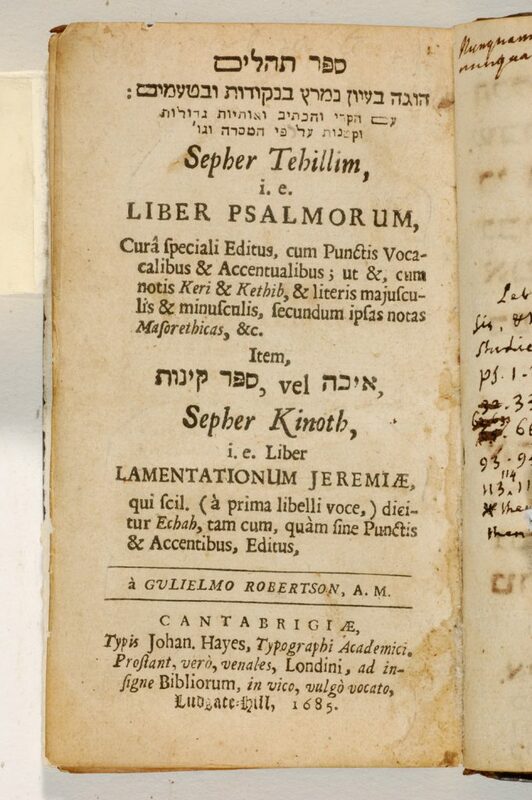 While Columbia has been collecting Judaica since its inception (with a donation from Kings’ College founder Samuel Johnson that included his Hebrew-Latin Psalms), many of the books were left uncataloged due to lack of expertise and Hebrew knowledge among the Library staff over the centuries. This was rectified with the creation of the Norman E. Alexander Library in 2010. The NEA Library hired three successive students from 2013 to 2016: Kelila Kahane (BC ’14), Hannah Vaitsblit (BC ’16), and Avinoam Stillman (CC ’17). The students were trained in copy cataloging (that is, the identification of pre-existing records that matched the books they analyzed) and copy specific cataloging. The students examined the shelves that included Judaica, book by book, and checked CLIO to see if there were any electronic records for the books. If not, they created a record for the books and added copy specific information (unusual bindings, owners’ marks, bookplates, etc.). 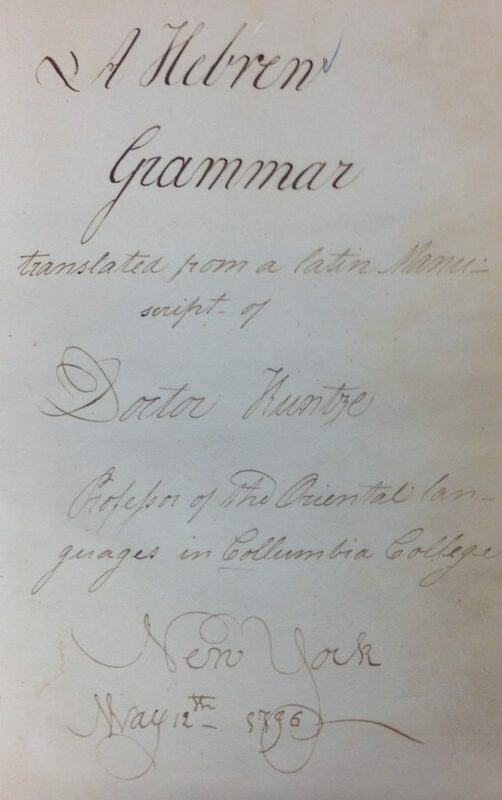 It was this project that identified a book in Columbia’s holdings formerly owned by Isaac Newton, and many other significant previous owners were identified as well. 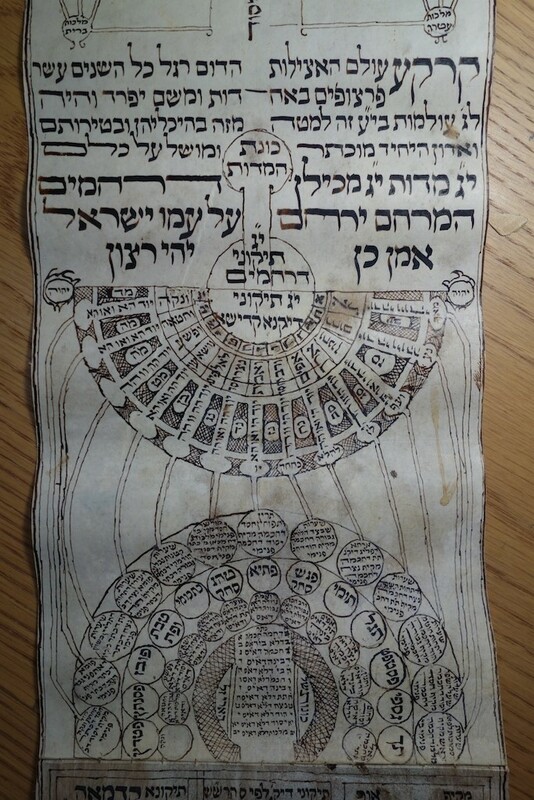 The project included both Hebraica non-Hebrew Judaica, but the work done is best exemplified with the Hebrew imprints: We have over 2,200 books containing Hebrew printed from the invention of moveable type until 1800 at Columbia. By the end of the project, over 1,000 records had been added or significantly updated to describe copy specific information, such as owners’ signatures, to the records. A detailed family history of Guiseppe Almanzi, whose collection we received as part of a gift from Temple Emanu-el in 1892. Some work remains, such as the creation of a detailed catalog record for Columbia’s 22 volumes of the Bomberg Talmud, but that should be completed by the end of the Spring semester. Many, many thanks to the great work of Kelila, Hannah, and Avinoam – thanks to them, our “hidden” collection of Judaica imprint is no longer hidden, but is now completely open for scholarly use! This entry was posted in Uncategorized and tagged Primary Sources, Rare_Books, RBML, The_People_In_The_Books on January 3, 2017 by Michelle. 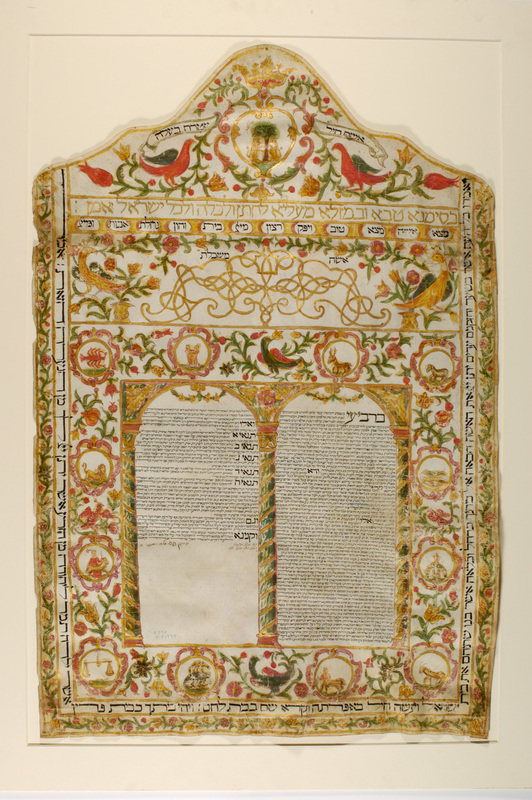 Columbia’s printed Judaica collection is composed of many different books, each with their own story to tell. Unfortunately, however, only about 1/3 of our books were actually in our online catalog. 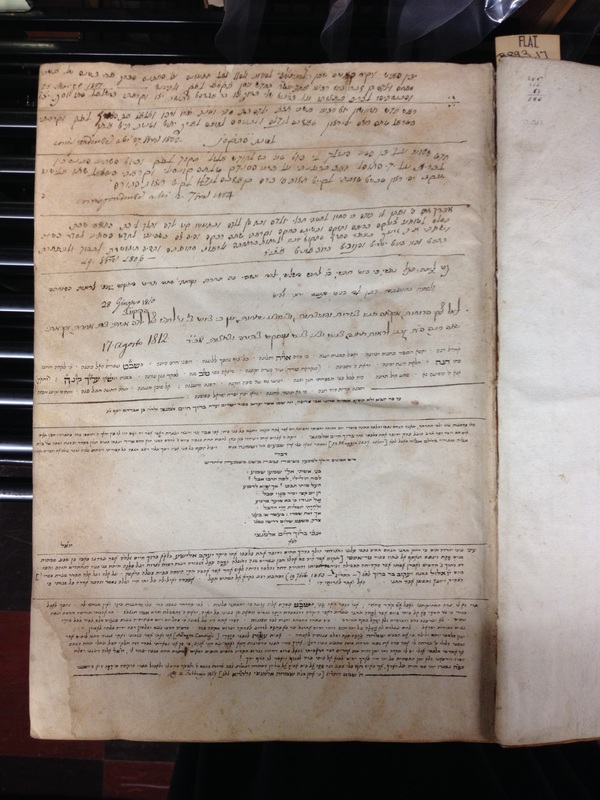 To rectify this, we hired Hannah Vaitsblit, a Barnard student who has been carefully checking every Judaica book in our rare stacks to make sure that they are cataloged and thus accessible and known to any potential users. 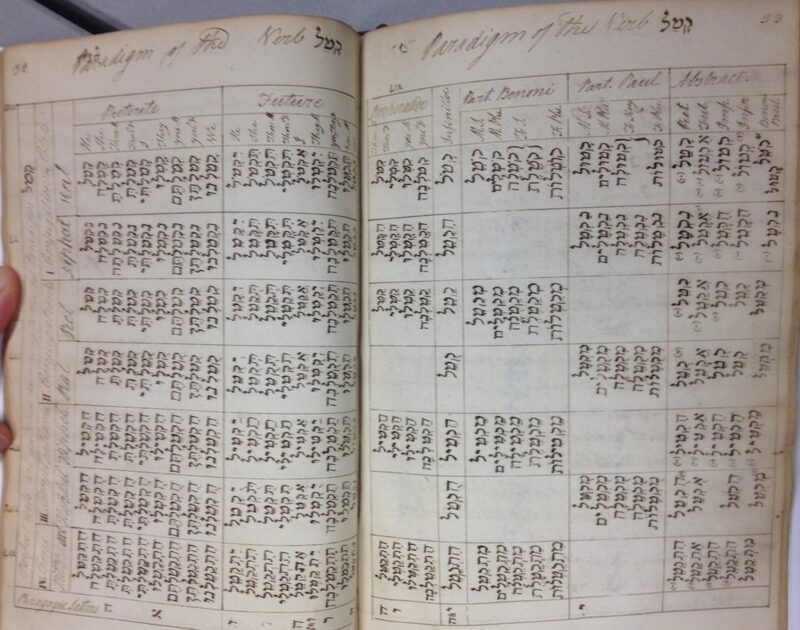 One of the things that Hannah has excelled at is marking instances of provenance, that is, notes indicating ownership of the book throughout its existence. One of the books that Hannah found was a Latin copy of Josephus’s De Bello Judaica (Wars of the Jews), printed in Cologne in 1559. 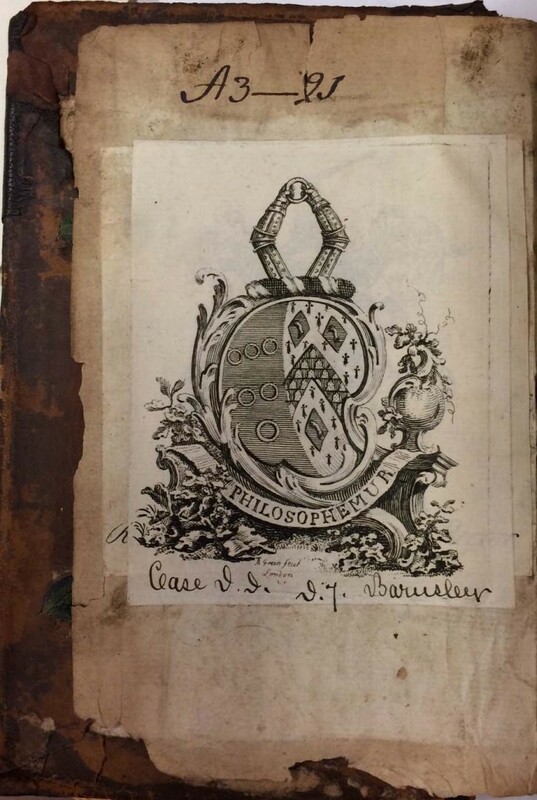 Hannah indicated the presence of the bookplate shown here, noting the presence of the “Philosophemur” shield as well as the Case information below it as she entered the record for the book into CLIO. The record was discovered by Newton scholar Professor Stephen Snobelen, who contacted us asking for more information about the book. He asked us if there was an indicator of “A3-21,” which was the classmark for this book in the Musgrave library (one of the libraries that owned Newton’s books). After Isaac Newton’s death, John Huggins, his neighbor, purchased the library for £300. (His bookplate can be seen peeking out underneath the “Philosophemur” plate.) The collection went from Huggins to his son Charles, and from Charles Huggins to James Musgrave, whose bookplate is seen above, with the family motto, “Philosophemur.” The library remained in the Musgrave family for generations, moving with them in 1778 to Barnsley Park, Gloucestershire, where the new classmarks were added in ink (on the bottom of the plate). The library was partially sold at auction in 1920, when it is likely that this book entered the market, ultimately ending up at Columbia in 1922. You can read the stories of some other discoveries of Newton books at the Huntington Library (Mede’s Works), at the King’s C ollege Library (interestingly, a Hebrew lexicon), at the University of Michigan‘s library, and at Cardiff University. This entry was posted in Uncategorized and tagged Josephus, Latin, Newton_Isaac, Primary Sources, Rare_Books on June 15, 2015 by Michelle. 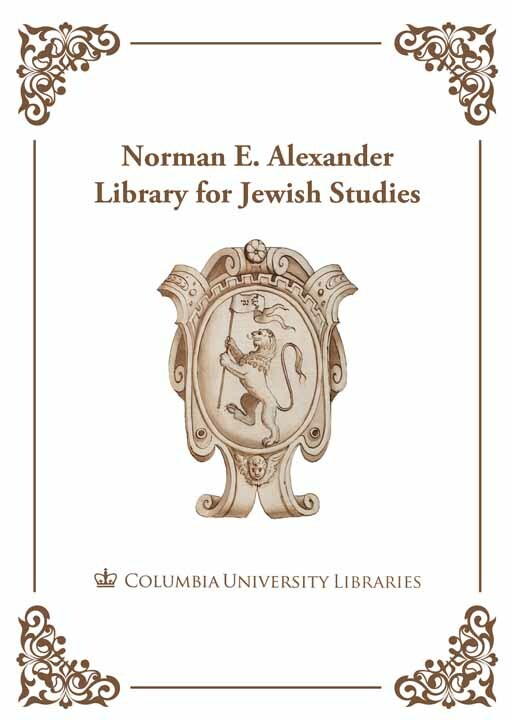 Columbia University Libraries/Information Services (CUL/IS) has received an award of $150,000 from the National Endowment for the Humanities to digitize field notes and linguistic surveys from the Language and Culture Atlas of Ashkenazic Jewry (LCAAJ) archive. The LCAAJ archive is an extraordinary resource for research in Yiddish studies that can shed much valuable light on language, ethnography, literature, folklore and music, anthropology, linguistics, Germanic and Slavic studies, and aspects of Central and East European history. The archive consists of over 600 interviews conducted between 1959 and 1972 with native speakers of Yiddish during a long-range comparative study to document the effects of physical, linguistic, and cultural channels and barriers on the geographic fragmentation of the Jewish and diverse non-Jewish populations that coexisted in Central and Eastern Europe before World War II. The LCAAJ project collected its interviews at essentially the last moment, when a diverse body of native speakers was still alive, aiming to address both the challenge of an endangered linguistic and cultural legacy, and the special potential that Yiddish provides for studying language and cultural contact and change. The two-year project funded by NEH will digitize approximately 140,000 pages of interview answer sheets that contain data from the interviews, carry out optical character recognition (OCR) and mark-up to enable their content to be searched and manipulated, and will make all the digitized content freely available to scholars on the Internet on a Columbia website. This source for historical, literary, or anthropological research, and for the study of languages in contact, and the evolution and differentiation of language communities, will then be available to a worldwide community of scholars. The written materials accompany more than 5,700 hours of recorded interviews that CUL/IS has already digitized through generous support from NEH, private foundations, the New York State Conservation/Preservation Program, and EYDES (Evidence of Yiddish Documented in European Societies, a project of the German Förderverein für Jiddische Sprache und Kultur), through which the audio is publicly available. The long-term goal is to eventually link the written content to the audio recordings of the interviews, and make the entire audio and written corpus available to students and scholars in an integrated form. The interviews contain a wealth of comments about Jewish culture and history from a place and time that is largely out of our reach today. Bringing the LCAAJ archive into the digital environment will increase exponentially its value to historians of Jewish Studies and European history, linguists, anthropologists, and students and teachers of Yiddish. Columbia University Libraries/Information Services (CUL/IS) is one of the top five academic research library systems in North America. The collections include over 12 million volumes, over 160,000 journals and serials, as well as extensive electronic resources, manuscripts, rare books, microforms, maps, and graphic and audio-visual materials. The services and collections are organized into 21 libraries and various academic technology centers, including affiliates. CUL/IS employs more than 450 professional and support staff. The website of the Libraries is the gateway to its services and resources: library.columbia.edu. This entry was posted in Uncategorized and tagged digital, LCAAJ, linguistics, Primary Sources, Yiddish on May 8, 2015 by Michelle. This entry was posted in Uncategorized and tagged Elections, Hebrew language, Israel, Primary Sources on March 13, 2015 by Michelle.